← COULD THE LONG ARM OF FRANCIS THE MERCIFUL HAVE REACHED ALL THE WAY TO AUSTRALIA TO ELIMINATE Cardinal Pell FROM OVERSEEING VATICAN FINANCES????????????????? 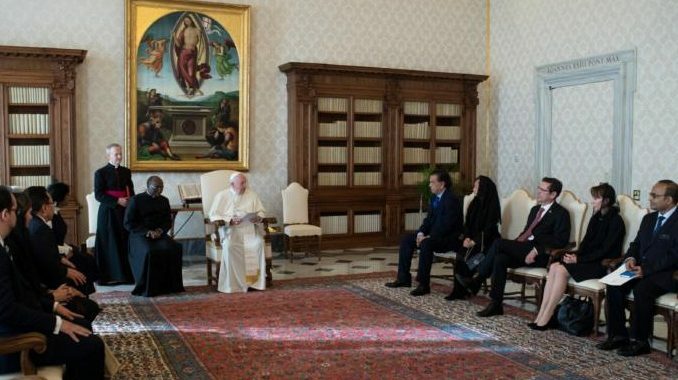 That has to be the impression after reading the Pope’s remarks to a Delegation of the International Commission Against the Death Penalty. Pope Francis reiterated his absolutist opposition to the death penalty which, by a singular gesture, he has also ordered be inscribed in the Catechism. Perhaps aware that public response might be problematic, he did not mention his opposition even to life sentences, having called them a form of “hidden death penalty”. This went far beyond the second edition of the 1992 Catechism, which affirmed the integrity of capital punishment in Scripture and Tradition but added that the cases in which the execution of the offender as an absolute necessity “are very rare, if not practically nonexistent.” By adding to a catechetical text a prudential opinion, John Paul II did something unprecedented and the whirlwind now being reaped in a pontificate less theologically acute, could justify concluding that the insertion of a prudential apostrophe was imprudent. Pope Francis uses the term ”inadmissible” to describe the death penalty, although it has no theological substance, and by avoiding words such as “immoral” or “wrong”, inflicts on discourse an ambiguity similar to parts of Amoris Laetitia. The obvious meaning is that capital punishment is intrinsically evil, but to say so outright would be too blatant. He also calls all life “inviolable,” a term which applies only to innocent life and has no moral warrant otherwise. Then there is the ancillary and unmentioned consideration of the role of punishment and hell in all this, conjuring a suspicion of universalism, which is the denial of eternal alienation from God. Exceptional delineations of authentic teaching on penalties were explained by Pius XII in his discourse to the First National Conference of Italian Lawyers in 1949 and the Sixth Internal Congress of Penal Law in 1953. A definitive new study is the book By Man Shall His Blood be Shed by Edward Feser and Joseph Bessette. Professor Feser has logically asked why we should have reverence for a father who has no reverence for the fathers, and warns that by divorcing his teaching from the constant tradition, Pope Francis is cutting off the very branch on which he sits. Pope Francis justifies himself by invoking a “”progress” in society, but this is a humanistic—even Pelagian—confidence that has no warrant in reality. It also lets loose a cataract of contradictions. For instance, one of the Pope’s men, Archbishop Marcelo Sorondo, praised Communist China for coming “closer to Catholic social teaching” than the United States, although there were 23 executions in the United States last year compared with 1,551 in China, more than all other nations combined. About Fr. George William Rutler 4 ArticlesFather George William Rutler, a parish priest in Manhattan, is a popular preacher and writer known internationally for his many TV programs on EWTN. He is the author of nineteen books, and he holds degrees from Dartmouth, Johns Hopkins, the Angelicum in Rome, and Oxford.